This year’s first CAP Forum focused on the topic of embedding your research in your teaching. As a result, we invited one of this year’s Research-informed Teaching Award winners to present on how and why she embeds her research into her teaching, and what her research is about. 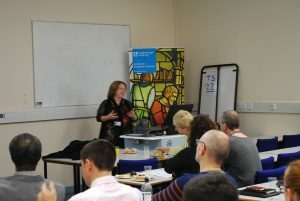 In 2002, Dr Cheryl Travers set up a module to fill what she perceived as a gap in Learning and Teaching from her experience of being an academic occupational psychologist. This gap was the extent to which the SBE finalists have developed their ‘soft’ skills in their final year after their placement. Her research is about her ‘Reflective goal setting model’ and the module puts this into practice- asking students to reflect on themselves, set goals, use the ‘power of written reflection’ to measure the impact of those goals. She asks the students to write a diary which for the first time this year will take the form of an electronic portfolio thanks to her new innovative system for students to log their thoughts. The discussion that followed focused mostly on her actual pedagogic research, and how other disciplines can apply her reflective goal setting model, from Arts students to STEM students, and even students wishing to learn a language while at University. Overall, it was an enjoyable afternoon with lively discussion, an abundance of food, and a wonderful talk by Dr Cheryl Travers. The session was lecture captured, which you can find here, and you can also find Cheryl’s papers on her research around goal setting, as well as her recent TEDx talk that she delivered at Loughborough Students’ Union below. This entry was posted in Employability, Events, Pedagogic, Pedagogic research, RITAs, Teaching Awards, Teaching excellence by Tom Berry. Bookmark the permalink.